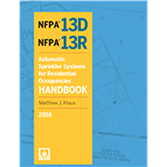 NFPA®'s 2016 Automatic Sprinkler Systems for Residential Occupancies Handbook helps contractors and engineers reduce fire deaths through compliance with NFPA 13D and NFPA 13R. Eight out of ten fire deaths occur in the home. Protect people with home fire sprinkler system planning and installation using NFPA's user-friendly new Automatic Sprinkler Systems for Residential Occupancies Handbook. Ideal for engineers, designers, contractors, and installers, this unique resource combines clear explanations, full-color visuals, and hands-on access to the 2016 editions of NFPA 13D and NFPA 13R text. You'll get the support you need to install residential fire sprinklers with confidence, so you can reduce risks while maximizing efficiency on the job. Loaded with new features -- including house plans showing sprinkler installation -- this one-stop source brings you up-to-date! Reference the complete texts of the 2016 NFPA 13D: Standard for the Installation of Sprinkler Systems in One- and Two-Family Dwellings and Manufactured Homes and NFPA 13R: Standard for the Installation of Sprinkler Systems in Low-Rise Residential Occupancies. A wealth of commentary clarifies the intent and reasoning behind NFPA 13D's and NFPA 13R's requirements -- with new explanations on key differences between the Standards. First-time, full-color house plans show correct sprinkler installation -- essential for contractors! A new plans review checklist gives those reviewing plans added assurance that nothing is overlooked. Full-color photos, graphics, illustrations, and detailed drawings clarify concepts. Historical Notes provide invaluable background on residential fire sprinkler use in the United States. Supplements written by experts include a new supplement on conducting sprinkler plans review, a revised Pedestal/Podium Building Design Using Model Building Codes and NFPA Sprinkler Standards, and an overview of technical changes for both NFPA 13D and NFPA 13R. An entire section is devoted to NFPA's Sprinkler Initiative, with research material and links to Home Fire Sprinkler Coalition and NFPA. New design features improve navigation and accessibility. Code Update icons indicate a change has occurred. "Ask the AHJ" FAQs help installers avoid common errors. Updated FAQs throughout make technical provisions clear. Consult the most comprehensive and authoritative source of facts and advice about residential fire sprinkler systems. Interested in other editions of the NFPA 13D-R Handbook? Use the drop down menu above to select the edition year you need.